We carry the ultimate Bamboo towels produced by combining 100% bamboo viscose fiber with pure natural cotton making them extremely soft and absorbant. 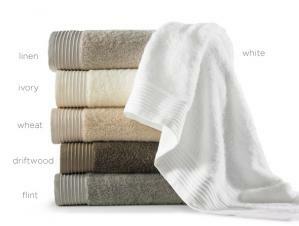 Commonly known as Rayon from Bamboo (rather than from synthetics), these towels are plush & super silky to the touch. The soft colors are created with low-impact dyes. Best of all, bamboo is a renewable resource that is easy on the planet. New and Improved! Thicker and more plush! Loops: 50% Rayon from Bamboo/50% cotton, 600 GSM Ultra-soft and absorbant Bamboo towels are made by combining the silky soft bamboo viscose with cotton. Bath Sheet: 38x68, 24oz, 600gsm. Bath Towel: 30x56, 18oz, 600gsm. Hand Towel: 20x30, 6oz, 600gsm. Wash Cloth: 13x13, 2oz, 600gsm. Click here to see all of our coordinating shower curtains too.